John John still just 250 pts from Yellow Jersey Wilko & 350 pts ahead of Jordy. The race is still tight as ever for top 5. All six events this season have been won by separate surfers. Toledo’s victory vaulted him to No. 7 on the Jeep Leaderboard, putting him back in the hunt. Holy Toledo, sporting green hair and all, was undoubtedly the best surfer of the week. Even Mick Fanning, J-Bay’s best ever, doesn’t even blink when he tells you Toledo is the fastest surfer in the world. That’s some seriously high praise from the 3x World Champion, who’s been carrying that torch for most of the last decade. Toledo’s speed is only the half of it, however. There’s a vicious rail game, absurd air game, and a heavy dose of creative genius. His lines are fresh and new. And while rookie Frederico Morais put on an incredible show this week as well, Toledo delivered the total package this week. At times, he made the rest of the field look almost old-fashioned. 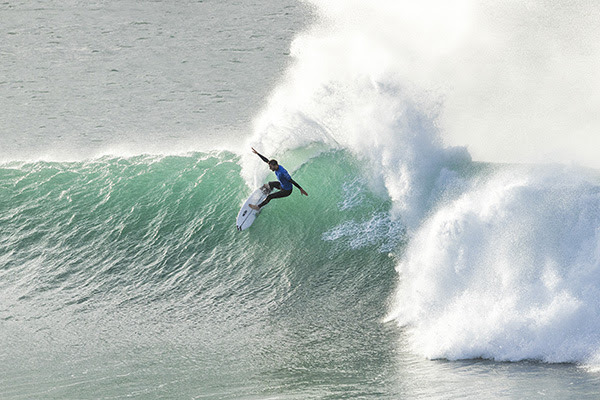 Behold, the high-flying Brazilian’s remarkable journey to the final at the Corona Open J-Bay. In the Final, Filipe got the best of an early exchange with a couple of massive carves and tucking into a clean inside section for a 9.17. Frederico answered with a square barrel on a big wave but exited it a little early where he could have probably chased a near-perfect score, posting an 8.33 to stay within striking distance of the Brazilian. Portugal’s rookie sensation took down a long list of heavy hitters on the way to his first Championship Tour Final. In the opening semifinal, former World Champion Gabriel Medina couldn’t quite replicate the level of performance he brought yesterday to eliminate Mick Fanning in the Quarters. Once again, it was the Portuguese rookie who found the best waves, and surfed them incredibly well to advance into his first Final. The former World Champion has quietly climbed to #9 on the Jeep Leaderboard as the Tour shifts to his wheelhouse. Medina matched his season-best result so far with an equal-third and will bump back up the rankings heading into an event at which he’s very comfortable: the Billabong Pro Tahiti. On paper, Julian Wilson against Filipe in Semifinal No. 2 was one for the ages. But unfortunately, the ocean slowed down a little bit and both surfers struggled at first to find the magic rides. Filipe somehow continued to find the right sections to get barreled and lay his big carves. Julian tried to fight back but couldn’t match the Brazilian’s flair on the smaller sets and got clipped by a couple of barrels that could have perhaps done the job for him. Previously, Filipe had eliminated the local crowd’s favorite, Jordy Smith, with an incredible first heat at sunrise and a couple of massive 9+ scores to launch his assault towards the event title. Julian Wilson’s J-Bay Streak Continues to Impress. The Australian surfed into the Semifinals at Supertubes for the third year in a row and jumps up the rankings. Heading into Tahiti, Matt Wilkinson still holds on to the Jeep Leader’s yellow jersey, but there’s been a shakeup just beyond him; Toledo and Medina are now firmly inside the Top 10, while Owen Wright and Adriano de Souza have each dropped out of the equal-second-place tie. Only time will tell what surprises await next. 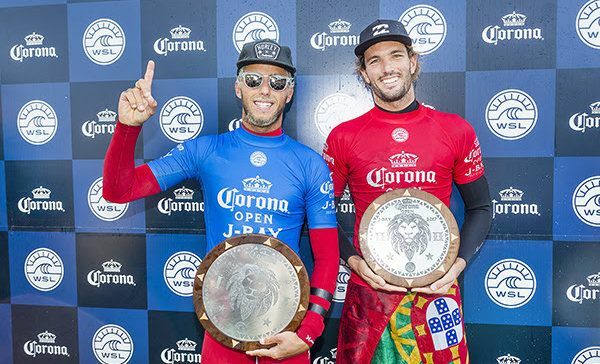 Filipe Toledo (BRA) claimed his fourth CT victory today at the Corona Open J-Bay.